The sloe (Prunus spinosa) is a prickly beast. 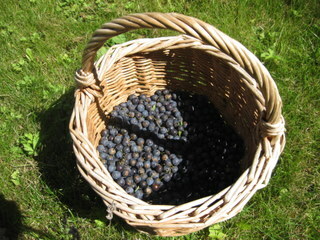 In order to brave the dangers of picking its bloomy fruit, it helps to understand the wonders of sloe gin. Faithfully brewed in the pantries of English country houses since Victorian times, this wonderful drink (known in our family, and doubtless many others, as ‘sluggins’) is a great way of converting a wholly unpalatable fruit into a rather memorable experience. 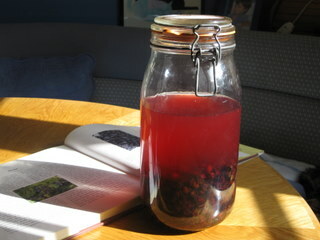 To make it, the sloes are macerated with sugar and gin and then left to their own devices in a cool dark place. After a few months you’ll have a wonderful, warming winter liqueur, great after brisk country walks, guaranteed to bring a smile to your cheeks and the circulation back to your toes. In this recipe, the sloes get a few days’ maceration with the sugar to encourage them to release some of their delicious, ruby-red juice, before adding the gin. Next: Next post: Is the Auberge de l’Ill Over the Hill?